Review: Wonderful Patisserie – Not so ‘Wonderful’ in my books! We walked in and asked if they were still serving dim sum, we were greeted by a nice enough waitress who told us that dim sum will take 20 minutes to come so we should order it first. My friend asked if it was possible to put the football on (an avid fan – watches every match) and nearly collapsed when the waitress said that there was a problem with the tv and itv does not work. After a failed attempt at offering to fix the tv for them we went about deciding what to order. Being a regular ‘dim summer’ I looked through the menu to see what was on offer and had to question if the dishes were in fact as I thought because of the severe miss-spelling. After deciding, we placed our order only to find out that from a list of 30 odd dim sum options only 4 or 5 were available. We ordered the prawn har gau, the shu mai, the char sui bun, salt and pepper squid (although even after repeating the order we were bought the salt and pepper prawns only to send them back and receive the squid), the duck spring rolls and the veg gyoza (the prawn wasn’t available). The veg gyoza came first, this was nice enough. The duck spring rolls were again not bad, although served with sweet chilli sauce rather than the plum sauce you’d usually receive. The squid when we finally received it was ok, although the pieces were slightly large for my liking, not quite bite size and slightly chewy too. to and it would seem they were placed in the steamer with little care as they were mostly stuck together and slightly defaced. The shu mai again was okie although not one of my personal favourites anyway. The Char Sui buns were probably the best item we’d ordered and were as soft and yummy as they should have been. order and were again told that they close at 10pm. My friend asked if this meant that at 10pm we would have to leave even if we still had food to finish? The waitress proceeded to tell us that at 10pm the doors will close and everyone will leave but that we could order take away if we wished to. We decided to get the bill (it took three waitresses to tear the receipt off the card machine) and leave (by this point it was 10.15 and to our surprise although we were the last customers, some of the waitresses and a few family members were still eating their evening meal whilst others just hovered around). In all fairness we did get there late and maybe if it had been slightly earlier we would have received better service and more food options (although the dodgy spellings on the menu does make you question the food). 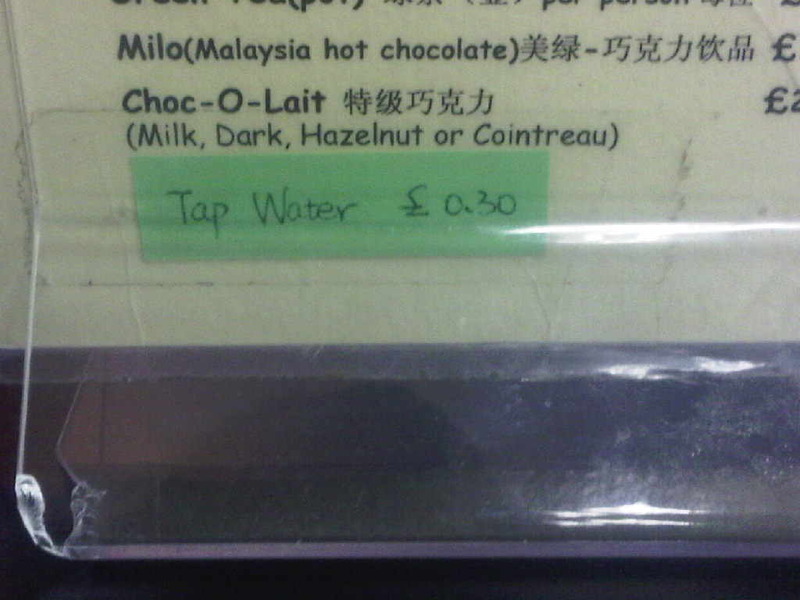 The cherry on top and possibly make or break in my books was the fact that there was a sign on the drinks menu stating that they charged 30p for tap water!!!! I don’t think the experience was worth the money free water was charged for and will be taking my dim sum cravings to somewhere more reliable in future!! Passed ‘Wonderful Patisserie’ the other day and it seems to have closed down. Given my experience back in June, its surprising it lasted so long!